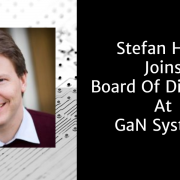 OTTAWA, Ontario, February 22, 2018 – GaN Systems, the global leader in GaN power semiconductors, announced today that Dr. Stefan Heck, the Chief Executive Officer and Founder of Nauto, has been appointed to the company’s board of directors. 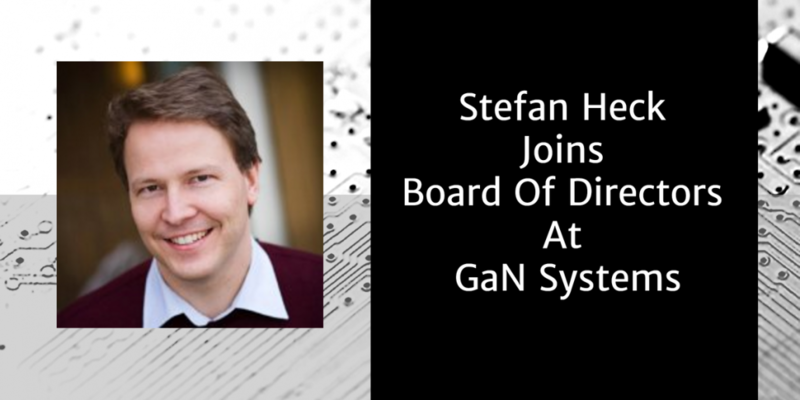 “We are delighted to welcome Stefan to our board. He joins us with an impressive set of accomplishments in key strategic roles leading growth initiatives in the auto industry, most specifically in autonomous vehicle space. His experiences and insights will be very valuable, particularly at a time when we’re in a rapid growth period as we extend our position as the world’s most prominent manufacturer of GaN power transistors and the leading player in the global GaN power device market,” said Jim Witham, CEO of GaN Systems. In 2015, Dr. Heck co-founded Nauto, the Palo Alto-based artificial intelligence-powered auto technology company whose connected camera network is making drivers safer and smarter today and informing autonomous vehicle development in the future. Prior to Nauto, Dr. Heck was consulting professor at the Precourt Institute for Energy at Stanford University, directed the Energy Transformation Collaborative and was a research fellow at the Steyer Taylor Center at the Stanford business and law school. Previously, he was a director (senior partner) at McKinsey where he ran their semiconductor practice and co-founded their Cleantech and Sustainability practice, working extensively with global 100 technology, industrial, infrastructure, building systems, retail, utility and energy companies. Dr. Heck is on the board of the Silicon Valley Leadership Group, an angel investor in disruptive technology companies and is author of a critically-acclaimed book, “Resource Revolution: How to Capture the Biggest Business Opportunity in a Century.” He was recently named to the inaugural Recode100 list. He earned a Ph.D. in Cognitive Science from the University of California San Diego and a bachelors of science degree with honors in Symbolic Systems from Stanford University. As an undergrad, he launched Stanford’s first Solar Car project, which continues in present day.